Guarda i segreti del Colosseo in questo tour di piccoli gruppi che ti porta nelle camere sotterranee dell'anfiteatro, che sono inaccessibili alla maggior parte del pubblico ogni giorno. Con una guida esperta, salterai la lunga linea d'ingresso del Colosseo con l'ammissione prioritaria, dirigendoti dritto all'interno per vedere dove una volta si trovavano gli animali selvatici e dove si ergevano i gladiatori. Poi esplori il Palatino e le rovine del Foro Romano. Limitato a solo sei persone, questo tour offre un'esperienza più intima. Cammina su piani originali di quasi 2000 anni, con accesso speciale a gallerie antiche e camere segrete. 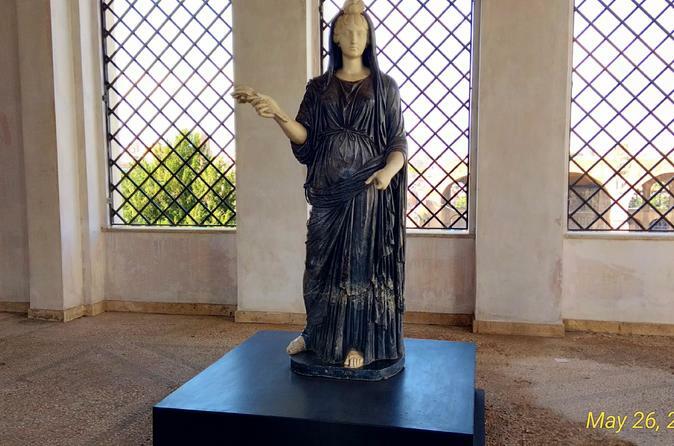 Dopo aver incontrato la tua guida alla stazione della metropolitana di Colosseo, dirigiti verso l'antico anfiteatro, il punto di riferimento più leggendario di Roma. Naviga oltre la coda d'ingresso con il tuo skip-the-line ticket, che ti permette di non perdere tempo in questa icona romana, dove le battaglie dei gladiatori un tempo intrattenevano più di 50.000 spettatori. Con la tua guida, inizia il tuo tour al livello sotterraneo, che è aperto solo a un numero limitato di visitatori ogni giorno. Cammina attraverso il labirinto di camere sotterranee per vedere dove animali feroci sono stati ingabbiati e ascolta le storie della tua guida sulle macabre battaglie dei gladiatori. Poi vai al livello dell'arena e segui la tua guida nell'area in cui sono state combattute le battaglie, invece di tracciare il bordo, come fa la maggior parte dei visitatori. Cammina leggermente sui pezzi del pavimento originale mentre guardi sotto attraverso gli spazi vuoti. Poi esci dal Colosseo, fai una breve pausa prima di continuare il tour con una passeggiata sul Palatino, uno dei sette colli di Roma. Passeggia tra gli alberi di pino mentre impari dalla tua guida le origini della Roma antica e scopri dove vivevano i più ricchi romani. Successivamente, dirigiti verso il Foro Romano, seguendo la tua guida sulle rovine che un tempo costituivano il cuore politico e commerciale della città. Ascolta le strutture come l'Arco di Tito e il Senato prima che il tuo tour finisca qui, dove hai la possibilità di rimanere più a lungo, se lo desideri. As with the Vatican, small group skip the line tours are the absolute best for this attraction. There are just so many people. Be prepared for a lot of walking and hills as the Ancient Rome part of this tour is all uphill - not for those who have a difficult time with stairs. Very knowledgeable tour guide and we enjoyed the undergound part of the tour - such incredible ancient history. The underground the colosseum and Ancient Rome was by far one of the best tours I’ve ever been on. Our tour guide, Luca, from Livitaly tours, was extremely knowledgeable and hilarious! The tour is max group of 7 and they get you right passed the long lines! Thank you so much!!! Highly recommend you choose Livitaly ! The meeting point was by the metro station. We arrived as instructed in good time for a 13:30 start. As there were so many groups being organised we didn't start on time. Our guide, who was very knowledgeable and had a good command of English, told us that as our slot for the Colosseum Underground and Arena wasn't until 15:45 that we would start by going to the Roman Forum - so off we headed. After queuing for around 40 minutes we entered the Roman Forum but immediately headed towards the Palatine Hill and only looked down on the Forum. We were disappointed not to have been able to walk around the Forum but this was probably because entry took so long. We had around an hour looking around the Palatine Hill and down to the Forum and down to the Circus Maximus. At 15:20 we left the Palatine Hill and were taken to the Colosseum to await our entry slot to the Colosseum. For this part of the tour the booking instructions indicated that the entry to the Colosseum may be shared with other participants for the Livitaly slot. We did not expect that the group would become over 40 people. The guide for this had a poor command of English and just kept saying "just imagine"! There were two young children in the group and the guide only seemed interested in them. Our entry time got delayed and we eventually entered some 40 minutes after our entry slot and around an hour after leaving the Palatine Hill. We had less than 10 minutes in the Arena and less than 10 minutes underground - fifteen minutes in total - significantly less than the 30-40 minutes indicated on the booking confirmation. No apology for the waiting around. The tour finished slightly late. We were told that we could spend as long as we wanted looking round the Colosseum, but as it closed at 17:30 there was insufficient time to do everything we wanted. The confirmation of the tour stated that as well as entry to Palatine Hill (which happened); the Roman Forum (could only look at this and not explore); the Colosseum (15 minutes of the tour) that there was entry to the Foro diAugusto. We never went anywhere near this. When we asked our guide we were fobbed off. Livitaly Tours who provided the tour need to up their game significantly. Palatine Hill, Forum, an the underground of the colosseum... top of colosseum we departed from guide and were able to tour museum and artifacts on our own before exiting. Underground only possible through group tours. There was a time change 2 weeks before the tour and Viator was promp, professional in making sure the change was ok and that we received our updated itinerary. 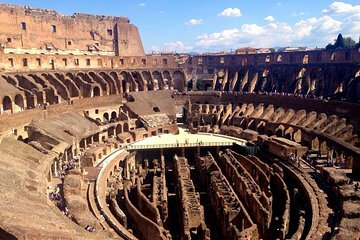 If you are going to the Colosseum and Forum, this is the Tour! Our guide was absolutely wonderful. The 3 hours flew by with her many stories and facts. We skipped all of the lines and were brought to places not all tours go to. I can't say enough about Viatour. Truly a wonderful experience.